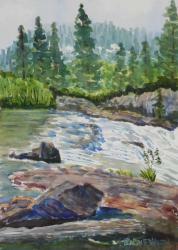 In the summer of 2015, I began painting each week or two with friends in the South Placer area. These paintings aren't great, but I've had fun with them and learned from them. 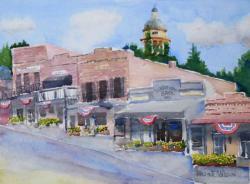 I make it a point to complete them -- from composition, drawing, to final painting -- in three hours or less. I seldom make changes back in my studio. 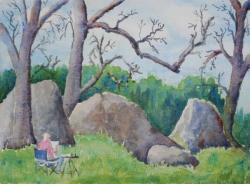 I see plein air painting as a discipline that will make me better at drawing. And the discipline to paint quickly will (hopefully) help me loosen up my style. 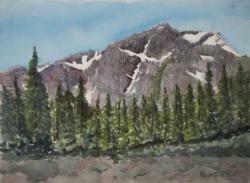 Watercolor: South Yuba Spring Runoff - 14.5" x 10.5"
Tim and Bill and I went plein air painting in late May along the South Yuba near Cisco Grove in the High Sierras. Watercolor, 10.5" x 14.5". 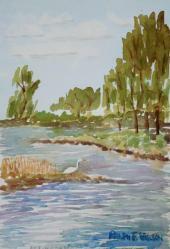 This is a small watercolor from a plein air expedition to the American River at William Pond Recreation Area near the rapids. A Great Egret (Ardea alba) is fishing from a small island in the river. 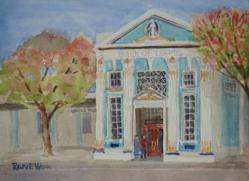 Watercolor, 7.5 x 11 inches. 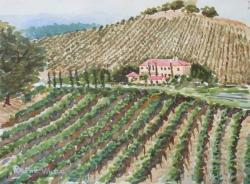 Watercolor: Monserrat Vineyards, Loomis, CA - 14.5" x 10.5"
Here's an early morning view of Monserrat Vineyards in Loomis, from Rutherford Way, looking west towards Monserrat Ln. 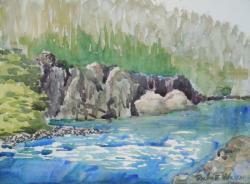 I was painting plein air alongside Bill Hersom, followed by a few touch-ups at home. Watercolor, 14.5" x 10.5". 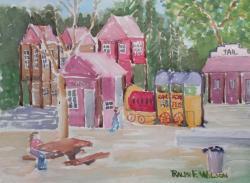 Watercolor: Maidu Park Playground, 14.5x10.5". This painting was the result of a couple hours of plein air painting with Bill Hersom at the Maidu Center Playground -- a great place to bring kids to play with their imaginations! Watercolor, 14.5x10.5". 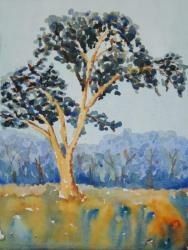 Watercolor: Old Blue Oak - 9" x 12"
Tim and I were out plein air painting in Johnson-Springview Park in Rocklin. This old blue oak, near the first tee of the disc golf course, had a wonderful shape that attracted us. Watercolor, 9" x 12". Watercolor: Traylor Ranch Rocks - 12" x 9"
Bill and I went plein air painting on Saturday morning at Traylor Ranch Nature Reserve in Penryn, California. It's getting green and warm and almost spring, but these oaks by the rock outcroppings hadn't leafed out yet. Watercolor, 12" x 9". 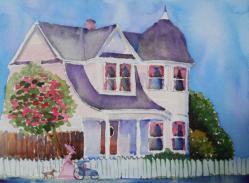 Tim and I went plein air painting early one Friday morning to capture this Victorian house at 5204 Fifth St. and the corner of Rocklin Rd., Rocklin, CA. It was a challenge to draw! About this house, the newspaper records, "Matt and Molly Moore built the Queen Anne-style house on the southeast corner during 1905, the year of their marriage. Matt was the Southern Pacific Railroad station agent; Molly was a schoolteacher and the pianist at St. Mary’s of the Assumption Catholic Church" (Placer Herald, March 3, 2013). Watercolor, 14.5" x 10.5". 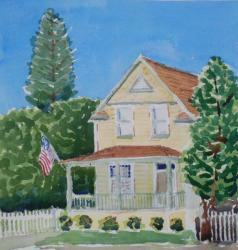 Watercolor: Yellow House with Red, White, and Blue - 8.5" x 8.75"
This house was across the street from Old St. Mary's Church at 5274 Front Street in Rocklin, CA. I was struck by the cheery American Flag flying in the breeze above the inviting porch. 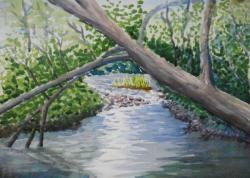 I was out plein air painting with Bill, Tim, and Rose. Fun! Watercolor, 8.5" x 8.75". 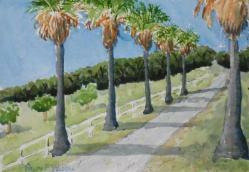 Bill Hersom and I went out plein air painting one morning to capture these trees, marching up the hill. They were planted more than a century ago to attract easterners to California. Watercolor, 12" x 9". In a private collection. 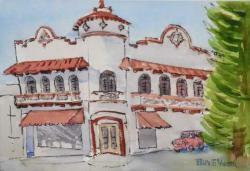 Watercolor: Tahoe Club, Auburn, CA - 12" x 9"
On April 2017 I went to a "sketch crawl" sponsored by Placer Artists League. 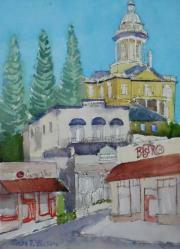 Most of the half-dozen participants painted one view or another of the Tahoe Club Building. This unique Spanish mission revival style with a cupola was built in 1914 when citizens pledged money to build a "men's social club" at 900 Lincoln Way. I spent about an hour and a half on this sketch, on a beautiful Saturday morning. Watercolor, 12" x 9". Watercolor: Flower Bed - 12" x 9"
The Placer Art League sponsored a "sketch crawl" at Horton's Iris Garden in Penryn on in mid April 2018. 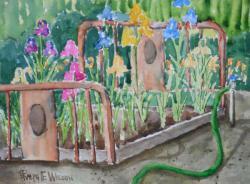 I was attracted by the rusty bed frame at the edge of the iris fields, which had a few iris plants growing in it. Of course, a bed frame is a metaphor for a flower bed. 180414. Watercolor, 12" x 9".